KUALA LUMPUR: Malaysian property prices are expected to increase at an average of between 10% and 20% this year, in light of rising inflation and increase in demand for local properties from foreigners, said Deputy Finance Minister Datuk Donald Lim Siang Chai. “Inflation in 2010 stood at 2.2% and was at 2.4% in the first two months of this year. We expect it to be higher this year due to escalating food and oil prices,” he said after the launch of the National Property Information Centre's (Napic) property market report 2010 yesterday. Lim also said many foreigners were looking to purchase property here because the prices of properties were cheaper than in neighbouring countries such as Singapore. “And Malaysia, because of the ETP (Economic Transformation Programme) has attracted a number of investments from overseas. Investments last year were four times higher than 2009. “We also expect more foreign companies to set up base here. Our Islamic banking is No. 1 in the world (so) all this will attract foreigners to come into Malaysia,” Lim said, adding that this would also contribute towards pushing up prices of properties in Malaysia. He said rising oil prices would also cause prices to escalate. According to Napic's statistics, the Malaysian property market recorded 376,583 transactions in 2010 worth RM107.44bil. Both the volume and value of transactions registered double-digit growth of 11.4% and 32.6% respectively from 338,089 transactions worth RM81.02bil in 2009. 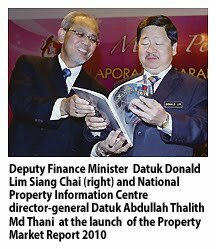 Napic valuation director-general Datuk Abdullah Thalith Md Thani said 2010's (RM107.44bil) value was a new high for the Malaysian property market. “In 2008 and 2009, we (Malaysian property market) suffered a bit. The volume of property transactions will go up (this year) but the margin will not be as high as last year. “We had a good year last year because we rebounded from the sub-prime experience,” he said. Abdullah added that Malaysia's fundamentals were still good, despite the uncertainties. Napic expects the property market to remain promising in 2011, supported by various measures proposed under the Tenth Malaysia Plan and Budget 2011. It said projects such as the Kuala Lumpur International Financial District, Mass Rapid Transit in Greater KL, the 100-storey Warisan Merdeka, the development of the Malaysian Rubber Board land in Sungai Buloh and the redevelopment of Pudu prison were expected to have positive spill-over effects. Napic also said the Government's Skim Rumah Pertamaku to assist young adults to own homes below RM220,000, together with other incentives such as stamp duty exemption of 50% on instruments of transfer on a house not exceeding RM350,000 for first time buyers, would increase transaction volumes of homes in this price range. “With the cessation of the Foreign Investment Committee's approval for the acquisition of properties by foreigners which took effect in June 2009, property investment in Malaysia will be more attractive to foreigners,” said Napic in a statement. “Given that foreigners are only allowed to purchase commercial and residential properties priced above RM500,000, it is anticipated that more activities will be recorded in the high-end housing units in sought-after neighbourhoods,” it said. PETALING JAYA: The residential property sub-sector dominated the overall property market in 2010, capturing 60.2% of total volume and 47.1% of the value of transactions, according to the National Property Information Centre’s (Napic) property market report 2010. The year saw 226,874 residential property transactions worth RM50.65bil, with volume and value recording 7.2% and 21% increases respectively compared with 2009. In terms of pricing, the Malaysian All House Price Index surged by 8.9 points to 140.7 points against 131.8 points registered in 2009. “Correspondingly, the price of the ‘average house’ moved to RM199,636 from RM184,574 in the fourth quarter of 2009,” said Napic. Kuala Lumpur had the highest price level in the country at RM430,163. Selangor and Sarawak followed with RM301,443 and RM253.391 respectively. Affordable houses below RM150,000 remained in demand, evident from the 57.1% representation of total residential transactions, said Napic, adding that houses within the price range of RM100,000 to RM150,000 formed the largest portion, accounting for 17.3% (39,360 transactions) of the total. Units priced between RM250,000 and RM500,000 were the second most active price bracket, accounting for 14.9% (33,739 transactions). For high-end housing units priced above RM500,000, there were 16,782 transactions from 12,122 transactions in 2009. Selangor accounted for 7,726 transactions, followed by Kuala Lumpur with 4,996 transactions. Terraced units formed 56.1% (26,774 units) of newly launched houses, comprising 12,429 single-storey terraces and 14,345 units of two- to three-storey terraces. Condominium and apartment units made up 14.2% (6,793 units) of total launches. Residential overhang increased marginally to 23,133 units in 2010 from 22,592 units a year earlier. Value rose to RM4.21bil from RM3.68bil previously, partly attributed to the increased number of launches in 2010. By price range, most of the overhang units were priced below RM150,000. Construction activity in the residential sub-sector showed cautious behaviour from developers. The review period witnessed 95,938 completions compared with 103,335 units registered in 2009. Housing units that began construction decreased marginally by 2.9% to 84,210 (from 86,743 units in 2009). New planned supply reduced by 5% to 76,306 units from 80,283 units in 2009. This sub-sector remained the most dominant contributor to commercial property activities, accounting for 62.1% of total volume. The review period recorded 24,731 shop transactions worth RM12.32bil, said Napic. The volume and value of transactions increased by 11.9% and 31% respectively compared with 2009 (22,107 transactions worth RM9.41bil). As at year-end, overhangs increased to 5,550 units (2009: 5,265 units) but lower value (RM1.67bil in 2010 compared with RM1.82bil in 2009). “The unsold under construction and not constructed units increased to 4,803 and 1,224 units respectively from 4,685 and 1,072 units respectively in 2009. On the supply front, construction activity in the shop-sub sector recorded mixed performance. “There were 7,721 units that completed construction under the review period and this accounted for a 14.4% decrease (2009: 9,025 units). “On a positive note, starts and new planned supply registered 39.7% and 11.5% increases to 7,823 and 7,924 units respectively,” said Napic. The retail market continued to record substantial amount of take-up at 268,027 sq m (2009: 269,504 sq m). With the exception of Kedah (-11,545 sq m) and Pahang (-11,349 sq m), all other states registered positive take up. Malacca had the highest take-up space of 92,880 sq m, followed by Selangor and Johor with 48,916 sq m and 34, 977 sq m respectively. The national occupancy rate reduced marginally to 80.2% in 2010 from 81.5% a year earlier. As at year-end 2010, the country had nearly 2.09 million sq m of space available for occupation. The future supply was ample with 94 complexes (1.73 million sq m) in the incoming supply and another 65 complexes (1.65 million sq m) in the planned supply. PETALING JAYA: Occupancy rate for purpose-built office sub-sector moderated to record 84.1% during the year compared with 85.2% in 2009. The take-up space was lower at 180,556 sq m (2009: 519,244 sq m). Kuala Lumpur led with the highest take-up of 68,996 sq m, followed by Malacca (46,121 sq m) and Perak (37,156 sq m), according to the National Property Information Centre’s (Napic) property market report 2010. Four states recorded negative take-up, including Selangor (minus 5,025 sq m). On the supply front, the market showed mixed performance. Completions dropped to 431,450 sq m (2009: 568,244 sq m) but starts increased substantially by more than four-fold to 603,355 sq m (2009: 142,992 sq m). New planned supply contracted to 201,423 sq m (2009: 328,185 sq m). As at year-end, the total existing supply of office space in the country stood at 16.56 million sq m offered by 2,227 buildings. The industrial property sub-sector was the least active, contributing 2.6% to the overall market activity. There were 9,838 transactions worth RM9.83bil in 2010, with volume increasing 22.1% from 8,059 transactions in 2009. Terraced factory/warehouse was the most favoured property type with 3,359 transactions worth RM1.19bil. The figure contributed 34.1% to the market volume. Vacant plots followed suit by forming another 32% (3,148 transactions). By price range, industrial units priced between RM250,000 and RM500,000 remained the most sought after, as indicated by its 26.6% share (2,616 transactions) of total industrial transactions, said Napic. Selangor remained the nation’s largest contributor with 3,124 transactions, followed by Johor with 1,518 transactions. On the construction front, there were lower completions (595 units) and starts (683 units) from 1,092 and 703 units respectively in 2009. However, new planned supply recorded increased activity with 872 units (2009: 562 units). Semi-detached units dominated with 50.4% (300 units) of completions and 49.4% (315 units) of starts, while terrace units dominated with 43.1% (376 units) of the new planned supply. The country had 93,139 existing industrial units with another 7,654 units incoming supply and 22,289 units in planned supply. The agricultural property sub-sector was the second-most prominent sub-sector, registering 21.5% (81,030 transactions worth RM11.38bil) of total volume of transactions. The volume increased by 16.8% in 2010 while the value recorded a higher growth of 36.4% from a year earlier. Perak led the agricultural sub-sector, accounting for 17.6% (14,256 transactions) of the country’s total volume of transactions. Johor and Sarawak followed with 16% (12,962 transactions) and 15.2% (12,329 transactions) respectively. By type, vacant agricultural land remained the most actively transacted with a 42.8% (34,682 transactions) of market share. Oil palm land followed at 16.7% (13,528 transactions), rubber land 14.5% (11,765 transactions) and paddy land 11.4% (9,266 transactions). The leisure property sub-sector showed a lacklustre performance despite increased tourist arrivals. For the year, 24.6 million tourist arrivals were recorded which noted a 4.2% growth against 2009 (23.6 million). However, average occupancy of three to five-star hotels declined to 53.1% compared with 55.6% recorded in 2009. During the year, six new hotels were completed to offer another 1,028 rooms to the market (2009: 19 hotels; 2,534 rooms).